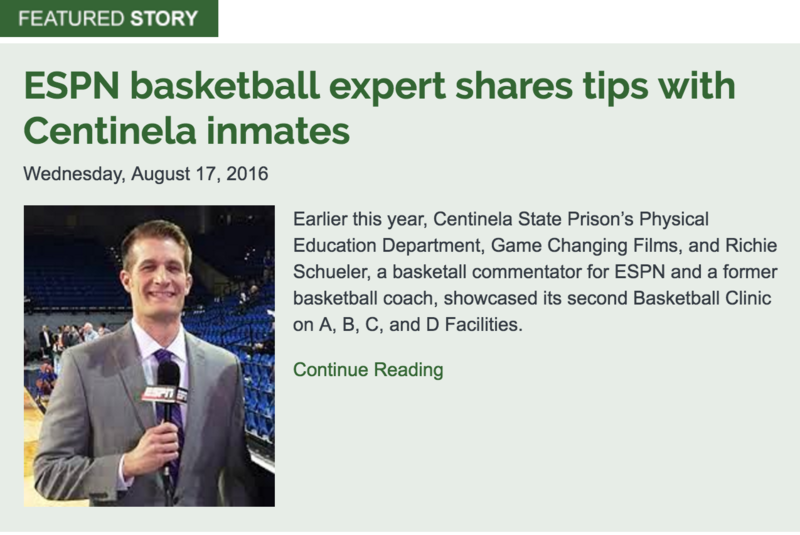 The California Department of Corrections & Rehabilitation wrote a very nice article on the prison basketball clinics that our crew has led over the past few months at Centinela State Prison (El Centro, CA). This prison has four yards, all of which are Level 3 or Level 4, the highest levels. A very large percentage of inmates at this prison are serving life sentences for any imaginable crime. By providing an opportunity for the inmates to “escape” the prison walls, we assist in their rehabilitation as well as the safety of the prison employees and staff. Using the platform of sports, our mission is to serve in the prevention of youth in prisons while simultaneously leaving a morale-boosting impact on inmates. Providing a positive rehabilitation environment through discipline and teamwork, we aim for our clinics and activities to give the inmates a sense of purpose, hope, and encouragement as they come together for a common cause. It is our goal to give inmates a voice in providing past experiences to help prevent youth from making similar mistakes. In doing so, we give those incarcerated a sense of ownership in preventing the next generation from walking down the same path.